Pat and I returned home to Brooklyn from Mexico on Sunday night, and pretty much immediately we both are sick. I seem to always catch a cold after traveling (it's still worth it in my book) and I have twisted thoughts that it is secretly payback for taking time off of work. Mexico was AMAZING! I am planning on posting pictures to the blog soon - even though I still haven't posted pictures from New Orleans or Iceland yet - ugh. But just being in the warm weather and staying right on the beach was truly magical. It was my first time in Mexico and I'm so glad that we decided not to stay on a big resort, and instead were able to experience some of the vibrant culture. Back in Brooklyn, I feel like I'm in the thick of baking for the holidays. I usually bake up a bunch of different cookies as gifts for my colleagues. I've made two things so far and am hoping to make a couple more items this weekend. I love the feeling of baking for the holidays, especially when I'm giving what I make to other people. Ever since I saw some of the chocolate and toffee barks in a Bon Appetit holiday issue a couple years ago, I've been dying to make something. 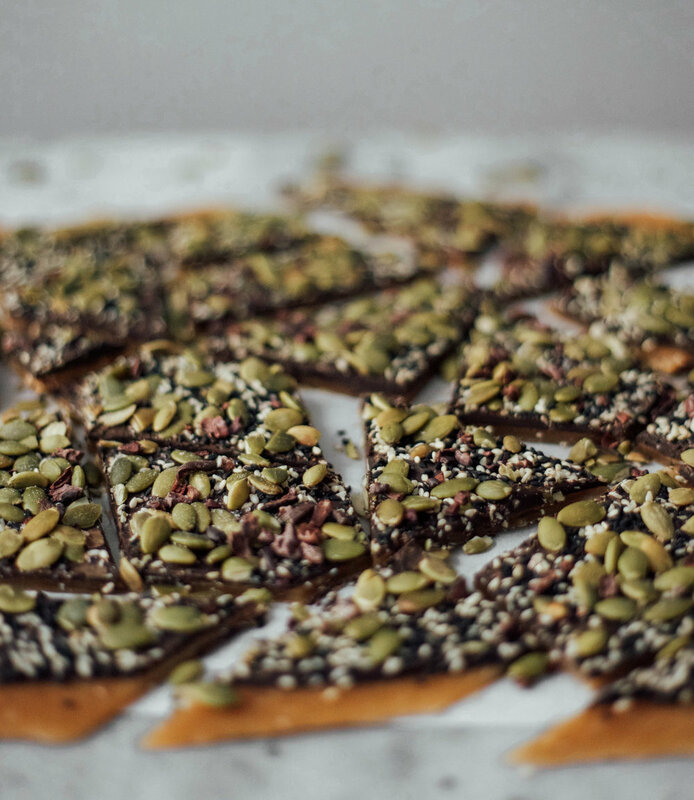 This Bourbon Seedy Toffee Bark was amazing - so flavorful and crunchy! And you can top it with pretty much whatever you want. Line large rimmed baking sheet with parchment paper. Combine butter, granulated and brown sugars, kosher salt, and 2 Tbsp. water in a large heavy saucepan fitted with candy thermometer. Cook over medium-high heat, swirling pan occasionally, until thermometer registers 300° (toffee should be a deep golden brown), 7–9 minutes. Remove toffee from heat and carefully stir in bourbon. Sprinkle baking soda evenly over surface and stir just until incorporated (be careful not to overmix). Quickly scrape mixture onto prepared baking sheet and tilt from side to side to spread mixture slightly; let cool 10 minutes.